Okay, I admit that title is a bit disingenuous. The truth is that here in the United States of America, one is innocent until proven guilty in a court of law. 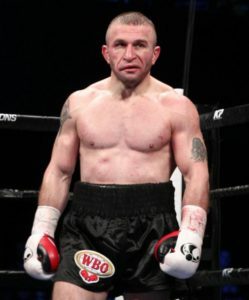 Therefore, middleweight Antandil Khurtsidze, who was arrested on Wednesday in a roundup of people reputedly connected to what the United States’ Attorney of the Southern District of New York referred to as “a Russian and Georgian Criminal Enterprise,” has done nothing wrong in the eyes of society. Still, the man is now up on charges and his upcoming title bout with Billy Joe Saunders is at least temporarily kaput. That does not constitute a good day. Specifically, Khurtsidze, a 33-2-2 product of the nation of Georgia who now lives in Brooklyn, is standing accused of conspiring to commit wire fraud and with breaking the RICO (Racketeer Influenced and Corrupt Organization) Act. If convicted, the man can face decades in prison, be fined a ton of money and eventually end up under supervised release. The group Khurtsidze is reputedly connected to is known as the Shulaya Enterprise, a Russian/Georgian crime syndicate led by one Razhden Shulaya. Among the Enterprise’s alleged operations are: illegal poker establishments in Brighton Beach, the extortion of gamblers and business owners, the attempted high tech defrauding of casinos, the theft of 10,000 pounds of chocolate (it’s true), the theft of other cargo shipments, the employment of a female Enterprise member to lure in and rob unsuspecting males (after rendering the victim’s unconscious with gas), the movement of untaxed cigarettes, the intention to open an after hours club (where, among other things, illegal narcotics would be sold), plans to bribe law enforcement, and forgery. With an assortment of charges, such as a “murder for hire conspiracy” and “conspiracy to sell firearms to a felon” lodged against its members, the Shulaya Enterprise appears to be quite a fearsome group – at least on paper. All of this, of course, leaves middleweight titlist Billy Joe Saunders high and dry. He and Khurtsidze were supposed to fight in England this July. Now that his opponent has far more pressing things to attend to, Saunders will have to wait for another opportunity to fight. This, of course, only adds to the strangeness of Saunders’ title reign, which has consisted of twitter rants, long periods of time outside the ring and a ho-hum performance against Artur Akavov last December. Still, Saunders’ future looks to be far brighter than Khurtsidze’s is at the moment. Sometimes it’s good to put everything in perspective.